It gives me hope that America also has citizens like you who don’t buy this jingoism hook, line, and sinker. I can personally guarantee that here in Europe Americans are looked upon in a not entirely favourable light, which is a pity as I know most American folk are lovely – in fact my best friend is from Texas and lives here in Venice with me, but there is a certain arrogance born of this patriotic marketing that manifests in a superior attitude that does your fellow countrymen no favours, and I see it daily here in Venice where we have many US tourists. When the terrible tragedy of September the 11th happened it really wound me up when people (Americans) referred to New York as ‘The Capital Of The World’ . I saw this in print in National newspapers! It’s truly unbelievably presumptuous and this superior attitude all starts with the idea that the flag is the most beautiful in the world and that the whole world looks to America as a symbol of freedom. They certainly don’t where I come from. I have to admit there was a time when this sort of thing appealed to me as well, …a very long time ago. It’s strange when I encounter it these days, because I feel conflicted. 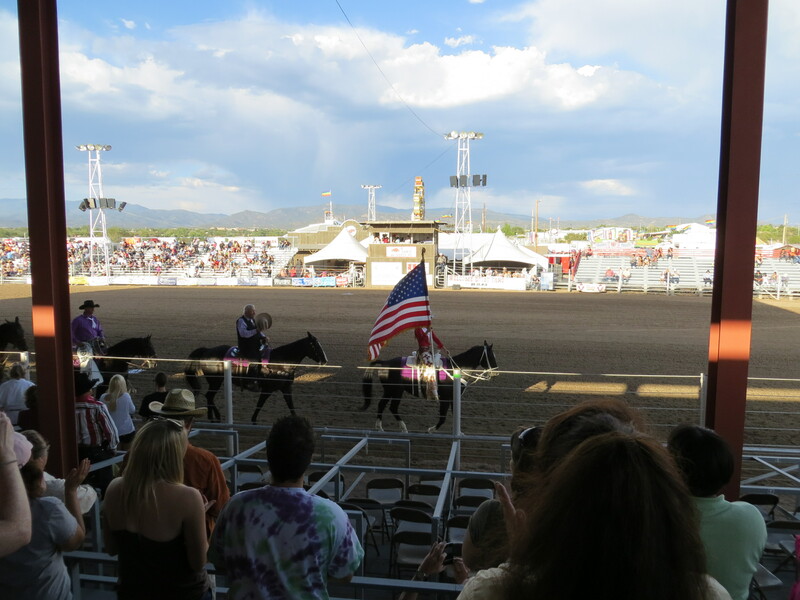 In this particular instance, I couldn’t help feeling the announcer sold himself (and the rodeo) short with his comments. It simply didn’t need to be that way. The sense of moral superiority which supports some of this unfortunate attitude goes back a very long way. For much more on the subject, check out “Founding Faith” by Steven Waldman. It is a history of the intersection between religion and politics in early US history. Hm, thanks for the reference Gerald. I happen to be in civilization, so maybe I can hunt it down the normal way for a change. My fiance is from England and in the U.K. I think the perception is the same as the commenter above. They perceive America as arrogant. That isn’t without foundation. When statements like “love it or leave it” are made that is quite arrogant. We arrogantly took this land from the native people. We arrogantly believe we rule the world. And we arrogantly behave as if all other countries are third-world and somehow inferior. …all the while falling further and further behind the other developed countries in many of the standard rubrices of advancement. Honestly, I feel like the nation has been taken over by fundamentalists at times, and I don’t mean Christians. It’s a certain view of the political economy that dominates the politics here, so much so that even when lefties win an election, we still end up drifting further to the right. Thanks for visiting my Pagan Kitty blog. I’ve already seen a Flying Spaghetti Monster reference and a healthy skepticism of jingoism. You’re my kind of people! 🙂 I look forward to reading more of your blog. You’re very funny. Thank you. I enjoyed your own blog, and I’m glad you came by to visit. Thank you. I enjoyed your own blog, especially pictures of all the green, lol. It looks like you live in a beautiful place. Fantastic, thoughtful post. Love America so much and at the same time have such conflicted feelings about America…. Thanks for sharing dude! I figure loving your country is about like loving your relatives; it isn’t because you think they are perfect; they are just yours, and that is all it takes. Thank you. With drones killing people in Pakistan, I doubt I would see the S&S as a “symbol of freedom” if I lived there. I am not entirely happy, in the UK, to have a de facto US airbases at Menwith Hill and elsewhere here. Even during WWII, US troops inspired resentment in the UK. But- “Love it or leave it” sounds circling the wagons to me. It sounds like the speaker feels under threat, even from people who seek to live in the US- so must love it at least a little. Paranoid, in fact. And yet- delight in the beauty of ones flag and celebrating that with people who think the same way- seems good to me. And I love the Union flag, and all it stands for- my Union, not your Union- and I respect e pluribus unum, because when we come together we are better. Thank you for adding this. I’m happy to hear what outsiders think on this, especially because the speaker’s comments on that subject are what got me thinking. yeah….i nodded a lot reading this post. i wish people would see our flag and associate with a compassionate and intelligent nation, but that isn’t going to happen. It will happen, just not at moments like the ones I spoke about here. …and perhaps not as often as you and I would like.